This is a new feature, just added for our Dance4Peace members. If you have a video camera connected to your computer, or if you use your smartphone, you can click this button and use your camera to record a video immediately – right now! For this to work, you have to give the app permission to use your computer or phone’s camera. You will see a request, if you are on a PC/Mac, and you must click OK. It will automatically switch to the Camera app on your iPhone or other smartphone. After you record, you can play back to see your video. Then you click “Submit” and we will get it. It’s that simple! Dance! Tell us about yourself! Show us your country! 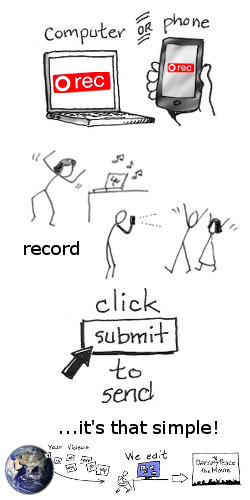 Record whatever you like. To see this page in French, click here. The technology for this recording is made possible by the good people at VidRack in Canada.